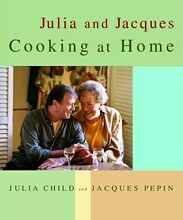 I was reading Julia and Jacques Cooking At Home yesterday – in bed, I might add. At five pounds of large-format hardcover, this is not the perfect book to cuddle up with. I had put down this book for too long though, and glimpsing it on the shelf, I grabbed it on the way upstairs. I like this cookbook for the back-and-forth bantering exchange between two such amazing chefs. First, Julia will say “Well, when making such-and such, I like to…”, then on the opposite page, Jacques will say “Julia likes to do it this way, but I prefer…” and come up with a completely different method. It reminds me that there is always more than one way to do something and do it well. My scrambled egg technique (from Jacques) is flawless. They were, in fact, the first thing I ever cooked for my boyfriend (intimidatingly at the time, a professional cook). This go around, the book threatening to suffocate me if I fell asleep and the snow falling outside, I was looking for recipes to use some of the beautiful savory bacon I had cured. Flipping through, I came across a recipe for potato salad that included bacon and had the added advantage of tossing the hot potatoes with cider vinegar, a technique I’d never considered. So this morning when I woke up, I wasn’t too suprised that I had a serious jones for some potato salad, even if it wasn’t picnic weather. It’s one of the first things I can ever remember making, probably in first grade, with some precooked potatoes and illustrated recipe cards. I might have added too much vinegar then, because ever since, I have been a fan of tart potato salad. This one completely fits the bill. let sit 10 minutes, tossing occasionally, to absorb the vinegar. combine and toss gently with potatoes. fold into potato mixture, tasting and correcting for balance. refrigerate at least an hour to chill and retaste for seasoning and acidity. I like my potato salad with lots of vinegar too. For me, it feels bland with out the pop of the vinegar. Todd prefers it with less, so he has to make his own! BTW- This is a really great book and I especially love the cover. Two people I very much admire. Great book. have you read “my Life in France” Julia’s biograpghy and “The Apprentice” Jacques’ autobiography. Both wonderful books and wonderful lives. 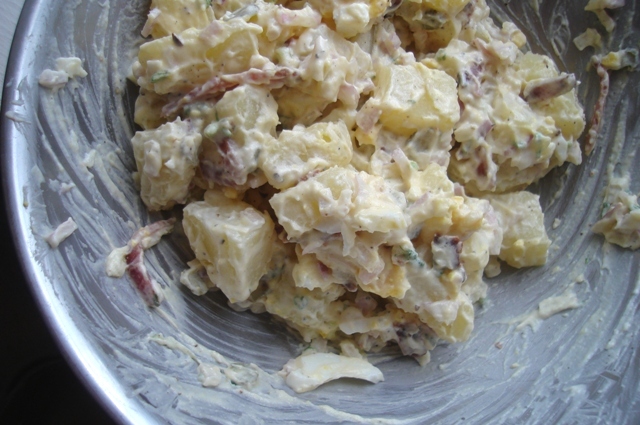 I am going to make the potato salad for dinner tonight…it is hot here and that will perfect. Just to let you know I have made the salad. Itr’s cooling in the fridge while I write. Also I used the vinegar from the pickles instead of cider vinegar. Mmm…now I want to try it with shrimp…Thanks for a yummy variation idea!